Lyr·i·cal (l r -s z m) n. 1. a. Expressing beauty and strong﻿ emotion. 1. b. The character or quality of subjectivity and﻿ sensuality of expression. Pas·sages (l r -s z m)n. 1. a. Details of a work, especially with respect to its qualities of execution. 1. b. The action or process of passing from one place, condition, or stage to another. Nobody sings the story anymore. Think Whitney in her day. into a top ten song,” Mama used ta say. Before Beyoncé, not yoo many sistas crossed over & got paid, but all hail the Princess of Pop with soul, cause nobody sings the story anymore. 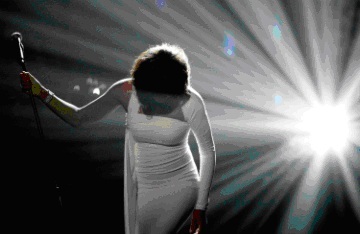 Think Whitney on a roll. workin a winter white couture gown and sequined slings. I visited her dressing room to wish her inner peace without all that bling. She never set out for the fame, yet spawned her own legacy of divas. But none with her gift. Child, please. My girl sang. She fed everybody. Sometimes rough, but that woman was brave. “Her strength comes from the church,” Mama used ta say. cause nobody sings the story anymore. Not like Whitney. “She's under Divine protection now,” Mama used ta say. When Lala played "You Give Good Love" in my Saturday class, I picked up the phone and made some phone calls. The rest is history!